City Hall has issued a statement announcing the Mayor’s decision to approve the planning application to develop the Elephant and Castle Shopping Centre. “We have always pushed for as much affordable housing as possible on this site and committed to do everything we can to support the existing traders. We welcome the Mayor’s decision and the enhancements announced by City Hall, which will mean increased support for traders. “This is a complex scheme that will create a vibrant, new town centre, which is a key part of the wider regeneration of Elephant and Castle bringing new homes, jobs and opportunities to the area. “We will continue to respond to the concerns raised by some local residents about aspects of the regeneration, and work with our residents, businesses, local councillors and Delancey to ensure the new development works for local people. For the businesses it has been agreed that 10% of the retail space across the sites will be affordable and Delancey has guaranteed a £634,000 tenant relocation fund to support traders. The council is currently working with traders on the principles that will inform this funding. “In addition, the council itself will provide new affordable retail at Perronet House and Arch Street, in addition to the affordable space already being provided by Lendlease and Delancey’s phase one developments. Artworks, the temporary business incubator hub at Elephant Park, will close as planned at the end of December as the site is now needed for the next phase of construction work. 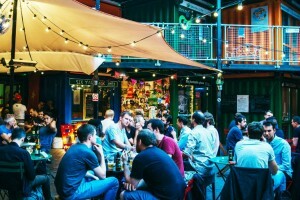 The small business community, housed in brightly coloured shipping containers, got started in 2014 as a temporary project by Stow Projects and Lendlease. The idea was to make good use of this large segment of the Elephant Park site, and keep it open to the public, until it was ready to be redeveloped. In the process, dozens of budding entrepreneurs were given a helping hand with the opportunity to develop their small business ideas. Artworks also proved popular with the public and many of the businesses that started there are being given support by Stow Projects and Lendlease to ensure they can continue to trade, either in Elephant and Castle or further afield. The Newington Temporary Library, based on site, will also be closing – on Saturday 22 December. 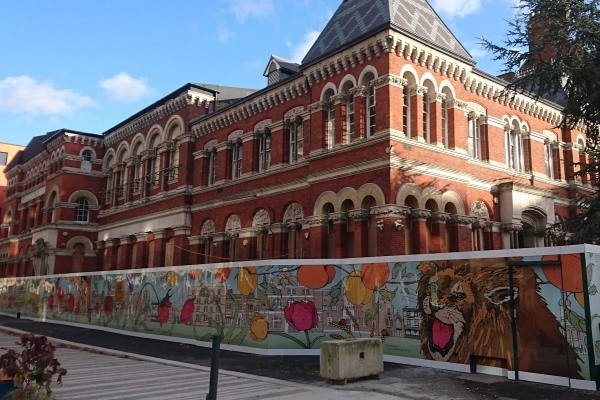 A new hoarding has gone up around Walworth Town Hall featuring artwork from graphic artist Kerry Lemon. Drawing Out Walworth is a new piece of temporary, public art which was commissioned by Southwark Council and supported by Lendlease. It is being used to protect the Grade II listed building which has been surrounded by hoarding since it was damaged by fire in 2013. But it will also provide an attractive backdrop to the new Walworth Square (which opened last week) until the town hall is brought back into use. The 65m artwork features a variety of motifs which celebrate the Walworth neighbourhood, past and present. These include elephants, giraffes and lions which invoke the zoological gardens for which Walworth was once famed; peaches, apples and grapes recalling the area’s 17C market gardens and an Echinacea plant as a nod to nearby Baldwins Apothecary. There are poppies for remembrance – as Walworth Square is home to the borough’s new war memorial – and also a number of architectural landmarks, including St Peters, the Pullens Estate and the Spare Street arches. The hoardings were arranged by a working party comprising a local community representative, a freelance arts consultant, Lendlease and Southwark Council. For a full explanation of the elements that make up the artwork see the council’s website. 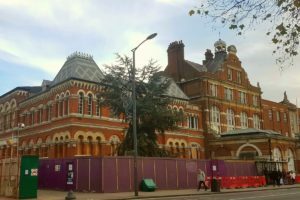 Southwark Council is consulting on proposals for the future of Walworth Town Hall, the Grade II listed building that was gutted by fire in 2013. The council has narrowed down the options to two proposals for finding investors who can help bring the building back into use – one from Castleforge and the other from General Projects. Now the council wants to hear what local people think. Three drop in sessions will be held next week where you can see the proposals and meet the bidders. 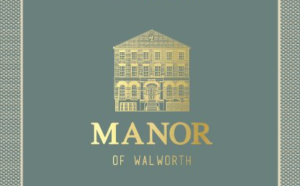 There will also be a presentation hosted by the council and the Walworth Society. The Art Academy is based at 155 Walworth Road London SE17 1RS. 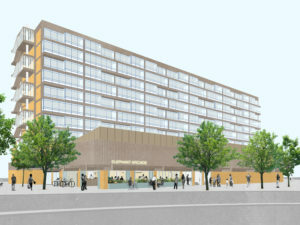 You can also read about the proposals and provide your feedback online: submit your comments via the council’s consultation hub and read more about the background to the project at www.walworthtownhall.com. All consultation responses will feed into an evaluation, leading to a report to Cabinet in spring 2019. 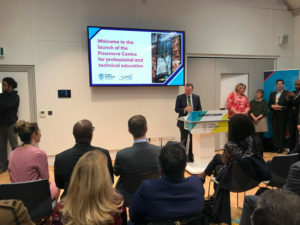 London South Bank University’s new Passmore Centre is a business skills and training hub that has just opened in Elephant and Castle. The centre has been created by refurbishing and transforming the old Passmore Edwards library on Borough Road. This was made possible thanks to generous funding from Southwark Council, London South Bank University and the Higher Education Funding Council. 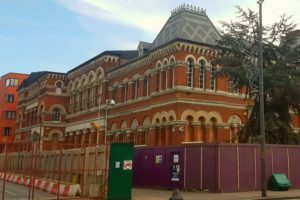 The multi-million pound investment has given the Grade II listed Victorian building a new lease of life and rescued it from the council’s register of endangered buildings. The centre will provide local people and businesses with access to high quality apprenticeships and employer-supported study. It will also provide facilities for employer meetings and community engagement and teaching, while also serving as a ‘one stop shop’ for connecting businesses with potential apprentices from the local area. 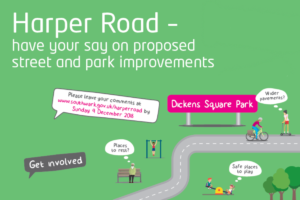 Southwark Council is consulting on improvements to Harper Road. 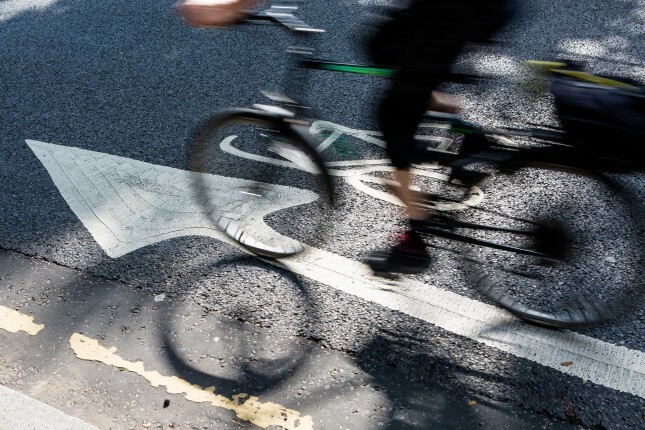 These include installing permanent width restrictions (to stop large vehicles) and improvements to pavements and crossings to make Harper Road more pleasant for all road users. Harper Road is in the project study area for the Walk Elephant initiative which will improve walking routes in Elephant and Castle. It will also form part of a future cycle quietway. The proposals were developed in coordination with other works in the street, including shopfront renewal at the shopping parade and the refurbishment of Dickens Square Park. You can find out more on Friday 30 November when the team will have a stall on the corner of Harper Road and Falmouth Road from 13:00 to 16:00. You can also provide your feedback online until Sunday 9 December. Elephant and Castle’s newest public space, Walworth Square, officially opens on Tuesday 27 November with a special dedication ceremony for its centre-piece, the new Southwark Memorial. Part of Lendlease’s Elephant Park development, Walworth Square is a new pedestrianised public space at the junction of Wansey Street and Walworth Road. As well as providing a home to the borough’s new war memorial, the Southwark Memorial, Walworth Square will be a place for community events and celebrations as well as Remembrance commemorations in years to come. 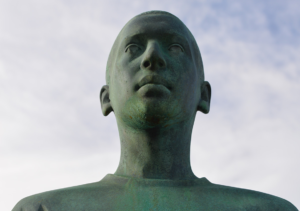 The dedication ceremony for this striking bronze artwork will be led by the Mayor of Southwark, Cllr Catherine Rose. It completes a series of events in Southwark to mark the centenary of the First World War Armistice. Commissioned by Southwark Council, with support from Lendlease and the Contemporary Arts Society, the memorial commemorates all the lives that have been affected by war and conflict around the globe, including the lives of members of the armed forces, civilians, refugees and others. The ceremony, which starts at 10.45am, is a public event and everyone is welcome to attend. 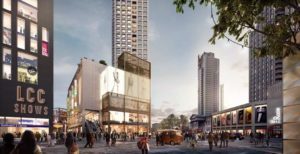 Lendlease is consulting the public on designs for the first plot in the fifth phase of its Elephant Park masterplan. 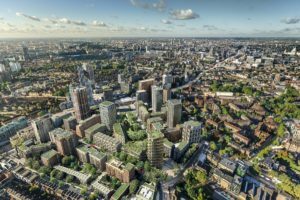 The developer wants the public’s feedback on its initial designs for plot H7 which forms part of the final phase of development to complete the buildings along Heygate Street, Sayer Street, and the southern boundary to Elephant Park. 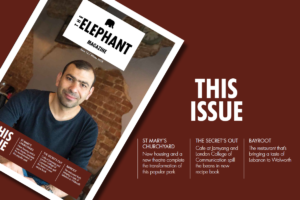 The new issue of the Elephant Magazine is out now. 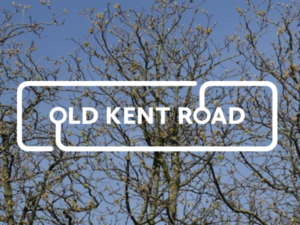 Southwark Council has launched a new website to help engage the local community with its plans to regenerate Old Kent Road. Like Elephant and Castle, Old Kent Road is designated as an opportunity area – an area with significant capacity for development – in the Mayor of London’s London Plan. The council has been consulting on its plans for several years and has already produced a draft Area Action Plan. Now the engagement is moving up a gear with more Old Kent Road forums; a new hub for the display of plans and models at 231 Old Kent Road (opening soon) and a new website at www.oldkentroad.org.uk. The new website means all the information about Southwark’s plans can now be found in one place, including all the planning applications plotted on one interactive map. The site also includes information about the council’s Back the Bakerloo campaign and explains why the proposed Bakerloo line extension from Elephant and Castle to Lewisham is so important to the future of Old Kent Road. 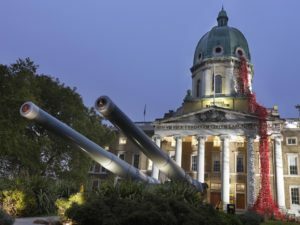 Elephant and Castle’s Imperial War Museum (IWM) will be commemorating the centenary of the end of the First World War on Sunday 11 November. There will also be a service at the Soviet War Memorial nearby in Geraldine Mary Harmsworth Park. Visitors will be able to see the Weeping Window – an art installation featuring several thousand handmade ceramic poppies cascading from the museum’s dome – until the end of the week (18 November). And you can catch Making a New World – a programme of free WW1 exhibitions, performances and public debates at IWM – right through until March. 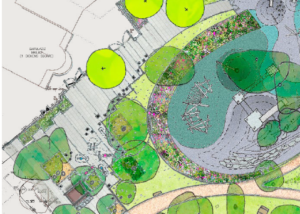 Southwark council is consulting on proposals to improve Dickens Square Park. The council wants to make the park more attractive and accessible for local residents and has just begun the third stage of consultation on the project. Celebrate Guy Fawkes night at Elephant Park this Sunday with a free, alternative light and sound spectacular. Spark! In the Park takes place on Sunday 4 November from 5-8pm. The event is free but you must book in advance. Do you have an idea for an event in Elephant Park? Lendlease wants your proposals for events to run at Elephant Park next year (between February and August). The events should be large activities – involving more than 200 people. Other than that, it’s your shout. Your event could be musical; fitness related; a fundraiser; something for children or a performance of some kind. Lendlease has been delighted by the response to the new park, so far, as well as all the interest that local people have shown in running events there. Now, to help plan events more effectively, Lendlease has started an official call out period for proposed events to be held every six months. The deadline for proposals for this period (February to August 2019) is 12 noon, 30 November 2018. In November the nation will unite in remembrance to mark the centenary of the end of the First World War. Elephant and Castle’s Imperial War Museum will be central to the commemorations. Making a New World is a programme of free exhibitions, performances and public debates taking place at the museum. It will explore how the First World War has shaped the society we live in today. Highlights include Renewal: Life after the First World War in Photographs and Mimesis: African Soldier, a multimedia installation remembering the millions of Africans and people of colour from across the globe who fought and took part in the war. Visitors can also see the Weeping Window – an art installation featuring several thousand handmade ceramic poppies cascading from the museum’s dome. 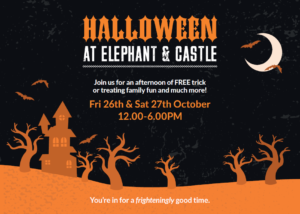 Children and families are in for a frighteningly good time in Elephant and Castle this weekend (26 & 27 October). Elephant Park, Castle Square, the Shopping Centre and Artworks will all play host to a variety of free Halloween Happenings on Friday and Saturday. Try the trick or treat trail, pinata smashing, creepy crafts or pumpkin decorating. Thrills and chills guaranteed. Local eatery, Cafe at Jamyang has teamed up with London College of Communication (LCC) to publish its own cookbook. 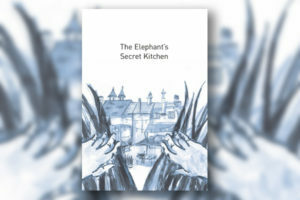 The Elephant’s Secret Kitchen combines recipes and anecdotes from the vegetarian cafe with elegant design, illustration and print from the university. People had often asked if the cafe had plans to publish its recipes. So chef and manager, Ilaria Mezzogori eventually enlisted the help of two of her own customers, LCC technical staff, Rahel Zoller and Flo Hawkins, to produce her own book. The book presented an opportunity for LCC students to get involved in a real-world design and print project and to gain valuable project management experience. In total, 30 contributors – artists, illustrators, photographers, designers and printers – combined their time and talents to produce this beautiful, quirky cookbook that’s as unique as the cafe itself. Black History Month starts today. 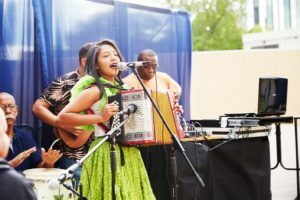 Dozens of events of events are taking place throughout the borough, including the Elephant, to celebrate the heritage of Southwark’s African, Caribbean and diaspora communities. Husky Studios on Amelia Street are hosting workshops for the Afro-Brazilian martial art, capoeira, and Southwark Playhouse will stage a selection of short plays about the emigrants aboard the Empire Windrush. Meanwhile, Draper Hall, on Hampton Street, is hosting a series of talks and events throughout October. These include a discussion about the work of film director Steve McQueen (12 Years a Slave) and a concert by Chineke Orchestra who will perform the music of black British composer, Samuel Coleridge-Taylor. 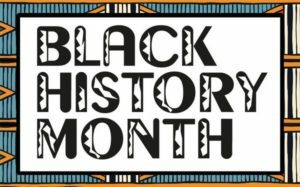 All these events, taking place in Elephant and Castle and throughout Southwark, and many more, are listed in the council’s Black History Month brochure. Most events are free but some need to be booked. Get ready for haystack building, scything displays and plenty of freshly pressed apple juice when the Walworth Garden Show comes to Elephant and Castle on Saturday 29 September. Part of the Nursery Row Park Autumn Fair, the show includes gardening with the Walworth Community Garden Network and a competition for best fruit or vegatable, best homemade jam and best vegetarian meal to be judged by former Blue Peter gardener, Chris Collins. The Walworth Garden show is funded by the United St. Saviours charity and aims to promote a greener Walworth . The show takes place from 1 to 4pm at Nursery Row Park, this Saturday, 29 September. Elephant and Castle’s Lola Odujinrin is the first British-African pilot to circumnavigate the world, solo, in a single engine aircraft. As part of a series of Elephant Talks, Lola is hosting an evening at Toulouse Lautrec brasserie on 25 September where he’ll tell the remarkable story of how he broke the world record and achieved his lifelong ambition. 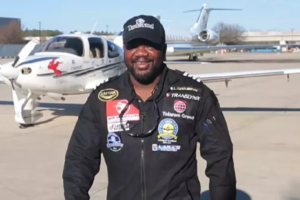 Lola, who was born in Elephant and Castle, completed his ‘One Man, One Plane’ expedition in March last year – landing at Washington Dulles International Airport, the same airport he’d departed from nine months earlier. Lola’s story is remarkable – a childhood dream turned reality that demonstrates the power of perseverance and tenacity. Now back in his old neighbourhood, Lola hopes his story will inspire the area’s young people to continue to pursue their own dreams and aspirations. The talk takes place at the Toulouse Lautrec brasserie, Elephant and Castle, on Tuesday 25 September at 7pm. Tickets are available from Funzing. Popular Peckham restaurant TUPI has opened a second venue in Elephant and Castle. 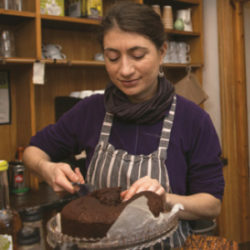 A local success story, TUPI – which started out by selling homemade cakes and sourdough on Rye Lane – is only a year old but has already earned enough kudos to branch out. Their new restaurant, on Castle Square, will serve European dishes with a South American twist. Located next to Elephant Park, Castle Square is one of several new public spaces being delivered by the regeneration of Elephant and Castle (look out for Walworth Square, coming soon). So if you’re in the area this weekend and feeling a little peckish, drop-in to TUPI and check-out their ‘bottomless brunch’. The proposed Bakerloo line extension from Elephant and Castle to Lewisham came a step closer today following the publication of a new report from Transport for London (TfL). Published in response to TfL’s latest round of consultation (conducted last year) the report includes proposals to integrate the Elephant and Castle Bakerloo line ticket hall with the new ticket hall planned for the Northern line. This would make changing between the two lines easier; reduce congestion and improve access to Thameslink services. Regards the extension to Lewisham, the TfL report proposes two new stations for Old Kent Road but not the third station that many people had hoped for at Bricklayers Arms. Southwark Council has expressed disappointment that the Bricklayers Arms station isn’t included in the updated plans. 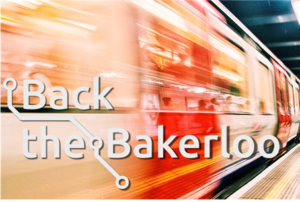 Nonetheless, the council continues to urge local residents to sign-up to the Back the Bakerloo campaign to ensure the necessary funding is secured for the extension to go ahead. Southwark Council has invited three organisations to submit Stage 2 proposals to revitalise Walworth Town Hall. The Grade II listed building was devastated by fire in March 2013. The council’s original plan to restore the building proved unaffordable when survey work revealed that much more work was necessary than originally envisaged, while construction costs continued to rise. Last year, the council reached out to arts and culture groups and organisations who might be interested in operating out of the town hall in future. After receiving several bids, the council has selected three: Castle Forge Partnership; General Projects and Milligan Creative Trade to submit full proposals for how they would manage the site. The three proposals – all of which mix space for creative business start ups with the council’s stipulation for public access to arts and cultural space – are due to be submitted to the council in November. This will be followed by a public consultation before a final decision is made in spring 2019. Autumn is the perfect time to enrol on a course, get creative and learn a new skill. The Art Academy on Walworth Road has published full details of all the short courses it will be running from 1 October onwards. Whether you’re interested in learning about animation, oil painting or digital photography, you’re bound to find something to suit you. The Art Academy is based in the former Newington Library building on Walworth Road where many of the courses are run (others are at Mermaid Court in Borough). As well as courses, keep an eye out for occasional exhibitions and public events held at the Walworth Road site too. The Cinema Museum is holding a public meeting about its future on Monday 3 September. The Cinema Museum is one of Elephant and Castle’s best loved institutions. Housed in the building that was once home to local-boy turned movie-legend, Charlie Chaplin, it was recently voted by Time Out readers as their favourite London “culture spot”. Earlier this year, the building and others on the site were acquired from South London & Maudsley NHS Trust by property company, Anthology. Monday’s meeting is one of a number of opportunities for members of the public to find out more about plans for the site and for the museum. Doors open at 18.00, for a 19.00 start. Anyone can attend but you must book via Eventbright. Free refreshments will be available. Delancey is consulting with local residents and businesses about its plans for Castle Square. Castle Square is the new public space on Elephant Road (between the station and Elephant Park) which opened in 2017. Delancey, the developer behind the town centre regeneration scheme, wants to use the square for a pop-up shopping destination while the shopping centre is redeveloped. Traders from the shopping centre will have first refusal on the new units and space will also be offered to other independent businesses that want to operate in the heart of Elephant and Castle. The proposal will provide continuity for shopping centre traders on a new site that’s right on their doorstep. It will also breathe life into the square and create an environment where people want to spend time rather than simply pass through. These plans come in addition to proposals to offer space to shopping centre businesses elsewhere in the neighbourhood, including at a new arcade to be built at Perronet House. You can find out more about the plans on the Elephant and Castle Town Centre website or by dropping into the Community Engagement Centre, unit 215-16 in the shopping centre. Southwark and Lewisham councils are calling on Londoners to ‘Back the Bakerloo’ and show their support for the southern extension of the tube line. The Mayor of London, Sadiq Khan, has made a commitment to extend the Bakerloo line from Elephant and Castle through to Lewisham. This will dramatically improve local transport links and relieve congestion on the bus and rail network. It will make south east London more accessible than ever before and it will provide yet another transport option for the people who live and work in Elephant and Castle. The extension will boost the local economy, especially along Old Kent Road, and will help to deliver thousands of new homes and jobs. The grand final of Elephant’s Got Talent takes place this week on Thursday 9 August. From Charlie Chaplin and Michael Caine, right through to Tinie Tempah, Elephant and Castle has produced some of the biggest stars in show business. Will they be joined by another? Following a fortnight of heats at Artworks, Mercato Metropolitano and Draper Hall, nine top acts are set to compete in the grand final. A panel of celebrities will judge the performances in front of a live audience at Elephant Park in what’s guaranteed to be a fantastic evening of music, fun and laughter. 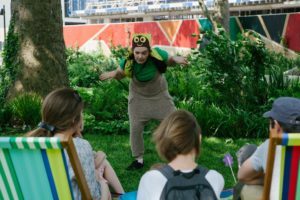 It’s free, it’s the holidays and the weather’s still beautiful – so why not pop down to central London’s newest park on Thursday? Who knows – you might just get your first glimpse of a future star. 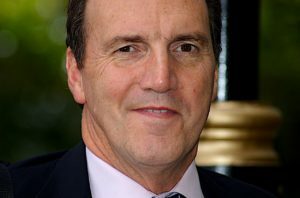 Former MP and government minister, Sir Simon Hughes has hailed the positive impact that London South Bank University has had on the city, following the news that he’s to become the new Chancellor. The former Bermondsey MP will succeed entrepreneur, Richard Farleigh, as Chancellor of the Elephant and Castle based university at an official ceremony this autumn. Sir Simon has pledged to work actively to support LSBU as it strives to transform lives and provide opportunities for individuals, local business and the many diverse communities in our neighbourhood. Southwark Council has given the go-ahead to convert under-used garages beneath Perronet House into a new shopping arcade. The arcade will provide local convenience shops for people living and working in Elephant and Castle and provide affordable retail space for local independent traders. Priority will be given to traders relocating from the shopping centre ahead of the town centre redevelopment. The space beneath Perronet House, a block of council housing on St George’s Rd, is currently split into two garage areas, one of which is in use with garages let to local residents. The other garage area had previously been partially let to the Princess Street medical practice and part has recently been converted into the St George’s pharmacy. Elephant Park is taking part in the National Park City Week initiative with an organised walk through the neighbourhood’s beautiful green spaces. The East Walworth Green Links Summer Walk takes places on Tues 24 July from Elephant Park to Burgess Park and is free to join. 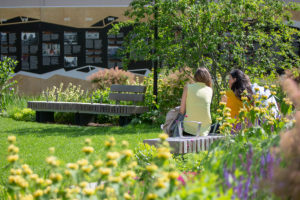 This guided walk will explore the nature and history of this connected mix of green spaces in Elephant and Castle and Walworth. You’ll get to meet and chat to the designers, the community gardeners and the champions of these diverse parks – spaces ranging in age, size and use – as you journey through Victory Community Park, Nursery Row Park, Salisbury Row Park and Surrey Square Park. Anthology, the new owner of the Cinema Museum and Woodlands Nursing Home site on Dugard Way, is holding two Meet and Greet sessions with the local community, later this week. 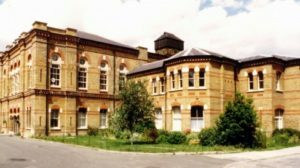 Anthology has acquired the site from South London & Maudsley NHS Trust. The purpose of this week’s Meet and Greet sessions is to introduce the company and to meet with members of the local community. Anthology isn’t presenting plans for the site at this stage but the team are keen to hear about your experiences and your aspirations for the area. The sessions, which are open to everyone, take place this Thursday 19 July from 12pm to 4pm and on Friday from 4pm to 8pm. 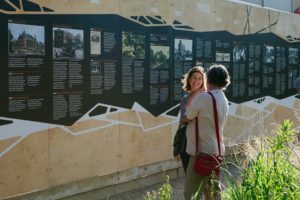 A new timeline revealing the history of Elephant and Castle has been unveiled at Elephant Park. The timeline, which covers more than 1,000 years of local history, shows how the area has changed over the centuries and explores the lives of local people (including a few famous faces, along the way). It makes up part of the hoardings for the ongoing construction work at Elephant Park and will be on view to the public for at least a year, while the remainder of the park is completed. The historic timeline was researched and written by Diana Cochrane of the Walworth Society and officially opened by the new Mayor of Southwark, Cllr Catherine Rose on 28 June. When complete, Elephant Park will be the largest new park to be built in central London for 70 years. Southwark Council’s planning committee has approved Delancey’s revised planning application to build a new town centre for Elephant and Castle, subject to the completion of a Section 106 agreement. The decision was made yesterday, 3 July. The revised application included a commitment to build 979 new homes (35% of which will be affordable homes) including 116 social rented homes. The plans also include new leisure space, shops and restaurants; a cutting-edge new campus for London College of Communication and a new entrance and ticket hall for the Northern Line tube station. Lendlease has got a packed programme of events planned for Elephant Park this summer. From film to theatre, storytelling to sport, there’s something for everyone. 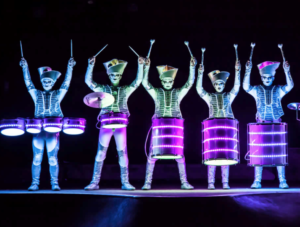 Highlights include the South Social Cinema South American film festival, Wimbledon tennis coverage and the Thursday nights Summer Series featuring Shakespeare in the park, live music and more. 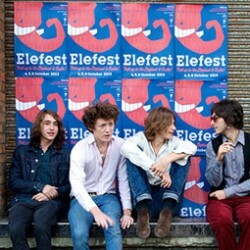 Visit the Elephant Park website for the full line-up and further updates. And while you’re there take part in the poll to choose a classic film to be screened on 12 July. In response to feedback from the public, Delancey has revised its plans for a new town centre for Elephant and Castle. The scheme is due to be considered by the council’s planning committee on Tuesday 3 July. 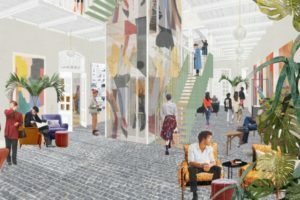 Delancey is still committed to building a cutting-edge new campus for London College of Communication and a new entrance and ticket hall for the Northern Line tube station, but has revised its plans for housing. The developer now proposes to build 979 new homes, 35% of which will be affordable homes, including 116 social rented homes. This is on a site where none exist at present and at a time when London badly needs new housing. Delancey has published a document outlining the proposal and the changes here. You can also find out more on the Elephant and Castle Town Centre website or in person at Delancey’s Community Engagement Centre in the shopping centre, where representatives are on hand to answer your questions. The Community Engagement Centre is based in units 215 and 216 of the shopping centre (upper level, directly opposite Café Nova) and is open Mon-Fri from 12-3pm and on Weds from 12–6pm. 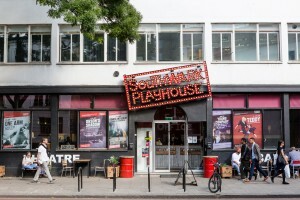 The regeneration of Elephant and Castle is delivering a permanent new home for the Southwark Playhouse. Currently based on Newington Causeway, this much loved theatre will move to the newly completed Uncle building at St Mary’s Churchyard next year. With a secure 125 year lease, the Playhouse will finally have a permanent, purpose-built venue for the first time in its 25 year history (having moved three times already). This latest move opens up new opportunities for the theatre, including a dedicated youth, community and development space and enables the launch of a second, smaller satellite venue in the arches at London Bridge station. 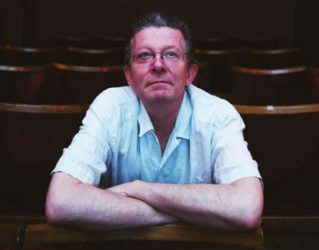 In order to fund the fit-out of its new Elephant and Castle theatre, the Playhouse has launched the Two Million Pound Wall Campaign. Reaching out to its legion of fans, the theatre is offering supporters the opportunity to contribute their own, unique designs to be featured in a crowd-sourced artwork in the new foyer, in return for a small donation. This weekend, two of our favourite creative venues throw their doors wide open to the public. 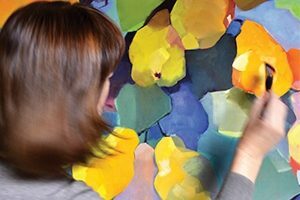 Hotel Elephant and Pullens Yards are each hosting their annual Summer Open Studios. Hotel Elephant, a not for profit workspace for arts and creative enterprise, is offering a glimpse inside the hive of creativity currently buzzing at its Spare Street studios. 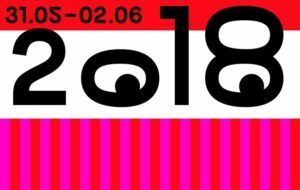 Pay them a visit on Saturday or Sunday to meet the artists and makers who’ve made the project a success, including photographers, printmakers, painters and costume designers to name but a few. Meanwhile, just a stone’s throw away, Pullens Yards will be opening up the studios of more than 50 local artists. Drop-by these picturesque Victorian workshops to buy pottery, crafts and jewellery or just to potter around, enjoy the sunshine and soak up the atmosphere. It’s that time of year again. Students across the country are completing courses and finishing exams and, with two major universities in our neighbourhood, that means it’s a busy time for Elephant and Castle. London College of Communication is putting on two degree shows over the next three weeks to showcase the work of final year undergraduates. The first show, which starts on Thursday 31 May and runs through to 2 June, will exhibit a range of innovative work from students studying advertising, journalism and photography. The second to be held from 21 to 23 June, will feature the work of students from the Design and Screen Schools. Both shows are open to the public and are free to visit. In conjunction, the University is also hosting a number of open workshops and symposiums on design and photography. Kick off your summer in the Elephant’s newest green space with a neighbourhood green gathering. 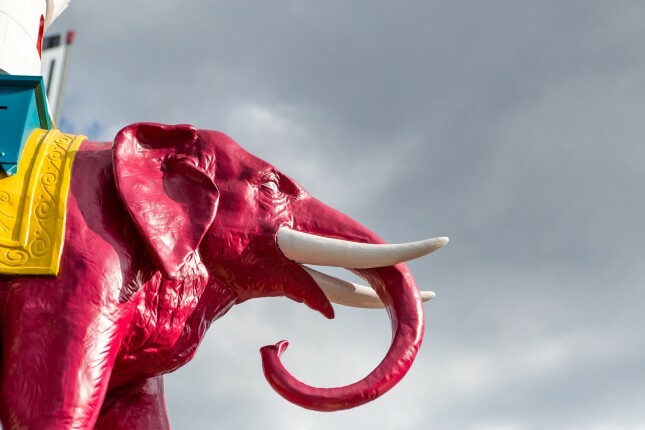 Flowerful Elephant, which takes place at Elephant Park this weekend, is the culmination of a week’s worth of Chelsea Fringe activities happening in London’s newest park. This free, fun-filled, family day will celebrate the area’s local gardens, growing groups, green spaces and horticultural history. Drop by between 12 and 5pm this Saturday, 26 May, to enjoy live performances, workshops and talks and a host of stalls selling arts & crafts. 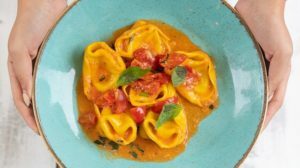 Three organisations that are making a big splash in Elephant and Castle, Mercato Metropolitano, Peabody and Hatch have teamed up to help female food entrepreneurs turn their dreams into reality. 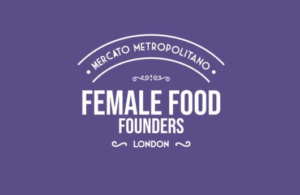 The Female Food Founders competition is offering a three month tenure at Elephant and Castle’s buzzing food market, Mercato Metropolitano, and up to £1000 in capital start-up costs to the lucky winner. 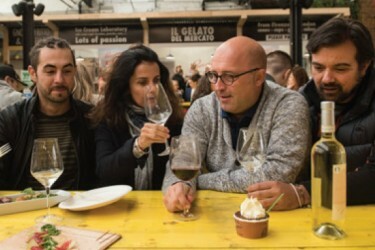 All three of the local organisations backing the competition are passionate about providing opportunities to community-focused projects and believe a three month summer stint at Mercato could be just the boost needed for one of the neighbourhood’s budding businesses. In addition to the market space, the winner will be given free mentoring, free business advice and free use of Hatch’s new co-working space, 55 East on East Street. The deadline for entries is Friday 25 May. The Alexandra Rose charity is holding a launch event for its fruit and veg voucher scheme at East Street Market this Friday, 18 May. The vast majority of us don’t manage to eat the government recommended five portions of fruit and veg a day but low-income families find it a particular struggle. Poor eating habits can start in early childhood and there’s growing evidence that a child’s capacity to learn in school is affected by what they eat. 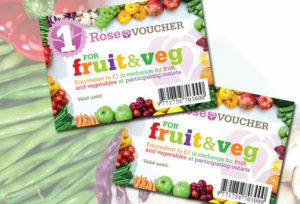 The Rose Vouchers for Fruit & Veg Project helps parents with young children to buy fresh fruit and vegetables while developing the skills and confidence to give their families the healthiest possible start. Rose Vouchers are worth £3 per child every week (double if the child is under one year of age). Vouchers can only be redeemed at markets that sell fresh fruit and vegetables. This means that the project not only helps young families but also supports our local markets. For Southwark Council, urban renewal is primarily about social regeneration; improving residents’ well-being and promoting strong communities. Bringing healthy-eating schemes like this one to the heart of the Elephant and Castle regeneration area is just one way in which the council is making good on that promise. 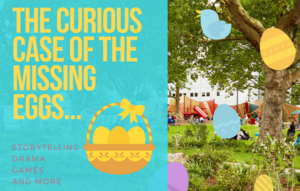 So come down to East Street Market on 18 May between 10am – 1pm where there will be a range of family activities including cooking, recipes and a free voucher giveaway. 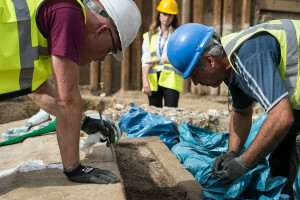 Last summer, a rare Roman sarcophagus was discovered on a building site in Elephant and Castle. Now, this exceptional discovery is going on display for the first time, as part of a new exhibition about London’s Roman past. The Roman Dead exhibition at the Museum of London Docklands uses finds from Roman burials across London to explore who Roman Londoners were and to reveal the city’s diverse past. The Harper Road sarcophagus was an exciting find but it’s not the first Roman grave to be found in Elephant and Castle. The latest archaeological research suggests that this part of Southwark had great ritual and religious significance for the Romans and that it was an important place for honouring their dead. Read more about the Elephant’s Roman history. CoolTan Arts is leading a celebration of the Elephant’s most famous son, with a Charlie Chaplin guided walk and film screening this Friday, 11 May. 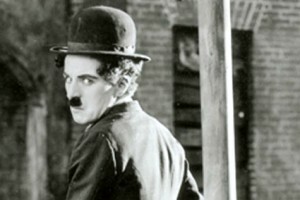 The walk will explore Charlie Chaplin’s rags to riches story, his early career in music hall and his family’s deep connection with the neighbourhood. 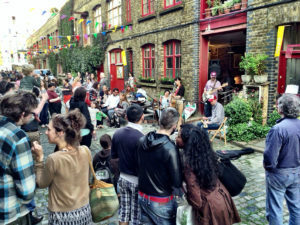 Culminating at East Street (Chaplin’s birthplace) the walk will be followed by a screening of several of the comedian’s iconic short films at 55 East, Elephant and Castle’s new community and enterprise hub. CoolTan Arts is a mental health charity based in the Newington Library building on Walworth Road. The charity’s programme of guided walks started life as part of a collaboration with Southwark Council and the NHS, recognising the link between physical activity and improved mental health. Each walk is researched, devised and led by volunteers to enable walkers of all abilities to come together, explore, learn and share experiences. Elephant and Castle’s Cinema Museum has won Time Out magazine’s Love London award as the Capital’s favourite culture spot. 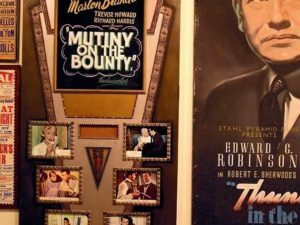 This wonderful museum, often described as a “hidden gem”, has been a labour of love for founders Ronald Grant and Martin Humphries, who first turned their treasure trove of cinema memorabilia into a public museum back in 1984. Elephant and Castle has a long history as a centre of entertainment, especially cinema. The neighbourhood is renowned as the childhood home of two movie giants – Charlie Chaplin and Michael Caine – and also houses the archives of legendary film director, Stanley Kubrick. So what better place for a museum dedicated to the movies? Based in the former workhouse where Charlie Chaplin lived briefly in his youth, the museum is the perfect place to spend an afternoon reliving the golden age of cinema or an evening enjoying one of their regular film screenings or talks. Read our 2015 feature on the museum or visit the museum’s website . 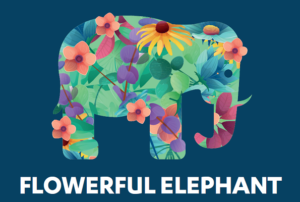 Flowerful Elephant, which takes place at Elephant Park on Saturday 26 May, is the culmination of a week’s worth of Chelsea Fringe activities happening in London. This fun-filled family day will celebrate the area’s local gardens, growing groups, green spaces and horticultural history. Drop by between 12 and 5pm to enjoy live performances, workshops and talks and a host of stalls selling arts & crafts. 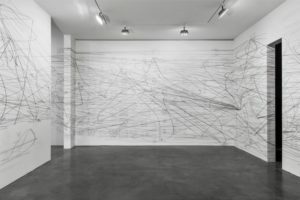 Drawing Room is a free, public art gallery dedicated to contemporary drawing. Formerly based in Bermondsey, the gallery was established in 2002 by curators Mary Doyle, Kate Macfarlane and Katharine Stout. Now it has moved to Rodney Place, Elephant and Castle, and will mark its arrival with a free afternoon of music from Ubu Ensemble on 20 May 2018. Drawing Room has taken up residence in the old National Windscreens building, near Lendlease’s Elephant Park development, thanks to help from Southwark Council. It’s one of a number of ‘meanwhile’ uses being made of the vacant spaces that temporarily become available as the regeneration progresses. Meanwhile uses help to ensure the area remains active and lively as sites are redeveloped, while also creating welcome opportunities for small businesses and community projects. Drawing Room will be based at Rodney Place for around 18 months until the site can be used for new housing. Elephant and Castle’s East Street Library is being refurbished and extended. Southwark Council will aim to ensure the library remains open throughout the works (which are due to complete late July). However, there may be a temporary reduction in services during the course of the works. 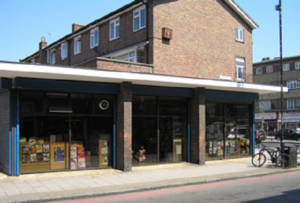 The next nearest library is close by at Artworks (Newington Temporary Library) and books borrowed from East Street can be returned to any other Southwark library. Artist, Kerry Lemon wants your ideas for the new hoarding she’s designing for the Walworth Square site. Walworth Square is a new open space, currently under construction next to Walworth Town Hall, which is due to open later this year. Kerry has been commissioned by the council and its regeneration partner, Lendlease, to design a hoarding for the side of the Town Hall facing the square on Wansey Street. The hoardings are necessary to protect the fire-damaged Town Hall until it’s brought back into use in a few years time (the council is currently seeking an organisation that will help to restore the building for arts and culture uses). Kerry’s new designs will provide an eye-catching backdrop to the new square and will help to make the site more attractive and inviting for several years to come, until the hoardings can come down. As well as being a pleasant new open space for the neighbourhood, Walworth Square will be home to new shops and cafes, and will host a programme of events throughout the year. It will also be the site of the new Southwark Memorial and provide a location in which to hold borough remembrance services. Kerry’s proposal for her 65m ‘canvas’ is to create a collage that celebrates everything that Walworth is renowned and treasured for. She’s already got plenty of ideas but now she wants to know what you think. Find out more on Kerry’s blog and be sure to drop her a line with your suggestions. Seven is a new exhibition which showcases the work of seven contemporary artists associated with Elephant and Castle. Featuring the work of Dylan Atkins, Frank Bowling, Simon Hiscock, Clive Jackson, Angela Lucas, Sonia Martin and Peter Massingham, it’s the latest exhibition to be staged at the Art Academy in the former Newington Library on Walworth Road. Opening next month, Seven offers a glimpse into the rich variety of work being produced by local artists. From Sonia Martin’s enigmatic figurative pictures to Frank Bowling’s famous abstracts, the exhibition celebrates the work of seven artists (through painting, photography and sculpture) each with a distinct perspective. The Newington Library building reopened to the public, on a temporary basis, in September last year (following the 2013 fire) and is currently being used by for a variety of art projects by The Art Academy. 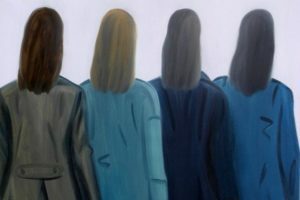 Seven is a free exhibition and runs from 16 May – 2 June. 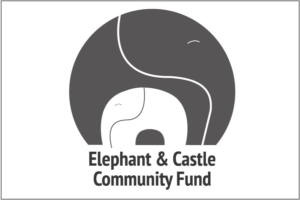 There’s just one week left in which to submit your application to the 2018 Elephant and Castle Community Fund. 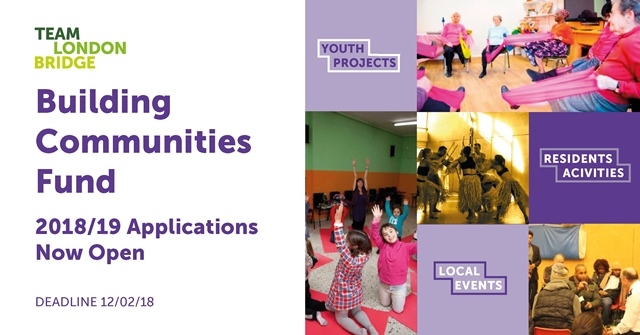 If you need funding to support an existing community project or to help get something new and exciting off the ground, your application needs to be in by midday Tuesday 10 April. 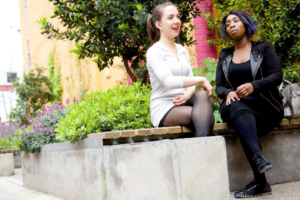 Since it was established by Lendlease and Southwark Council in 2012, the fund has awarded roughly £175,000 to around 40 community organisations and directly benefited thousands of local people. 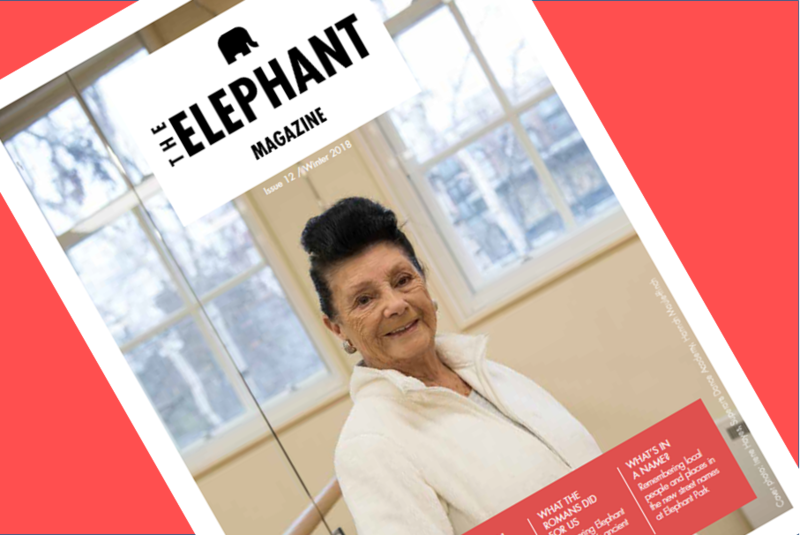 From film projects and school drama to skill-sharing and language classes, the wide range of initiatives supported so far reflects the amazing breadth of talent that exists in Elephant and Castle. As part of its commitment to Healthy Streets, Southwark Council is trialling a temporary width restriction on Harper Road. The new 2m limit to vehicle width will be trialled for six months until the autumn. The Healthy Streets Approach is designed to improve air quality and reduce congestion in London. Alongside improvements to Elephant and Castle’s parks and walking routes (as part of the Walk Elephant initiative) reducing the flow of HGVs and other large vehicles, on overly congested streets, is one of the ways in which the Elephant can become a better place to walk around and spend time in. You can find out more about the Harper Road trial and provide your comments on the council website. And you can find out more about improvements to local parks and walking routes here. Elephant Park has teamed-up with Blue Elephant Theatre to celebrate the start of the Easter holidays this Friday. 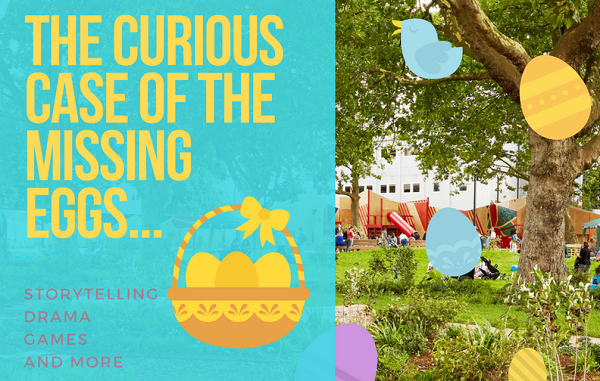 Bring your little detective to help the Easter bunny find the missing eggs. Drama music and games, led by local theatre group Blue Elephant, will bring the riddles to life as the children solve the mystery and save the day. This is a free event but spaces are limited so you’ll need to book in advance. Antic, the pubco behind the successful revival of the Elephant and Castle pub is set to open another on Walworth Road. The Manor of Walworth, will be a new, traditional public house based in part of John Smith House – former headquarters of the Labour Party – at 140 Walworth Road. Antic are promising a Georgian Manor House feel, in keeping with the rich history of the building. Expect up-cycled furniture, original fireplaces and stripped back rooms. The latest meeting of Borough, Bankside and Walworth Community Council will be held this evening at Amigo Hall, St George’s Cathedral, Lambeth Road SE1 7HY. The meeting takes place tonight, 19 March at 6.30pm. 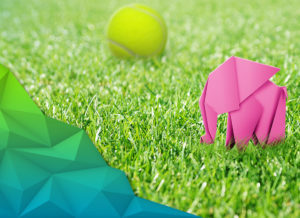 Elephant Atlas is a new exhibition which opens today at London College of Communication. 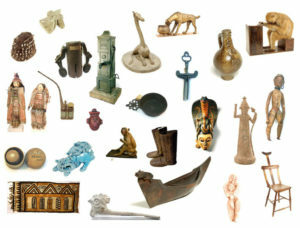 It features works inspired by Elephant and Castle’s historic Cuming Museum Collection. Stepping away from the traditional ways of presenting museum objects and subjects, Elephant Atlas features 17 artists and writers responding to the collection through photography, illustration, performance, installation, film, creative writing and workshops. Each contributor has used ideas raised by the objects and stories, choosing items or aspects which have captured their imaginations. The exhibition is free and runs from 16 March to 4 April. The 2018 Elephant and Castle Community Fund has gone live. This is your opportunity to apply for grant funding to support an existing project or to get something new and exciting off the ground. This year, grants of between £500 and £5,000 are available from a total fund of £50,000. The deadline for applications is midday, 10 April 2018. Got a question about the Town Centre development? If you want to know more about the proposed plans for a once in a lifetime opportunity to deliver essential regeneration for Elephant and Castle Town Centre, Delancey’s project team will be on hand at the shopping centre to help. The proposals offer significant benefits for a huge range of people living, working and learning at the Elephant. This new town centre will become a focal point and cornerstone of the wider £3bn regeneration underway in Elephant and Castle, whilst reinforcing the status of the area as a major cultural and education destination in central London. The plans include more than 1,000 new homes on a site where none currently exist; new restaurants and leisure space; a live music venue and a new cutting-edge campus for London College of Communication. As part of Delancey’s engagement with the local community, from Tuesday 13 February, you’ll be able to drop in to the Community Engagement Centre (unit 215 at the Elephant and Castle shopping centre) to meet the Delancey team. So, if you live or work locally or if you’re just interested in what’s happening, stop by and say hello. And if you have a business in the shopping centre, this is a great opportunity to find out more about the help and assistance on offer to relocate. An Ecuadorian themed ceremony was held on Saturday 10 February to celebrate the naming of Maldonado Walk. This small passage next to the newly built Crossway Church, just off Hampton Street, has been named in honour of Pedro Vicente Maldonado, the 18c Ecuadorian scientist who died in London in 1748. 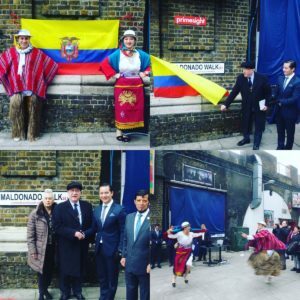 The ceremony brought together politicians, the local community and Ecuadorian dignitaries, who’d flown to London specifically for the occasion, to enjoy traditional music, dancing and food. The new street name, originally proposed by Cllr Maria Linforth-Hall is, in part, recognition of the contribution that the local Latin American community have made to Elephant and Castle over the past 30 years. It’s also part of the Walk Elephant initiative to make the Elephant an easier place to navigate and to get around on foot. Maldonado Walk forms part of the emerging Low Line; a new walking route along the railway viaducts which link Blackfriars to Camberwell. It follows hot on the heels of Spare Street, which opened just around the corner in 2016, and houses local arts organisation, Hotel Elephant, in five refurbished railway arches. On 30 January, Southwark Council’s planning committee voted to defer Delancey’s application to redevelop the Elephant and Castle shopping centre as a new town centre for the area. Delancey has listened to the concerns and issues raised by the local community, Ward Councillors and the council and made a revised offer. Peabody is holding two public exhibitions about the Borough Triangle site this week. 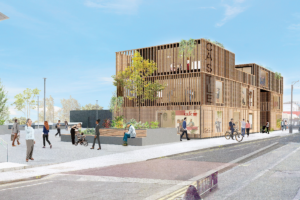 The housing association plans to build new homes, a range of retail and commercial spaces and new public space for local residents on this site between Borough Road and Newington Causeway (currently home to Mercato Metropolitano). The exhibition, to be held at the London School of Musical Theatre, is an opportunity for the community to find out more about the proposals. Peabody’s project team will be on hand to talk through the plans, answer your questions and collect feedback. Lendlease is holding a public exhibition to show the outline designs for the fourth phase of Elephant Park which includes two development plots on Rodney Place (plots H11a and H11b). The Posh Club is a glamorous performance and social club for older residents of Elephant and Castle. 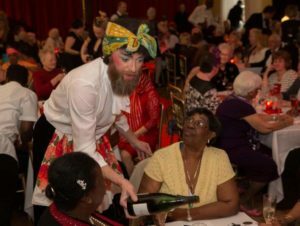 Each three-hour event is styled as a tongue-in-cheek ‘posh’ 1940’s afternoon tea with three live show business turns, volunteer waiters in black tie, vintage crockery and an in-house pianist. 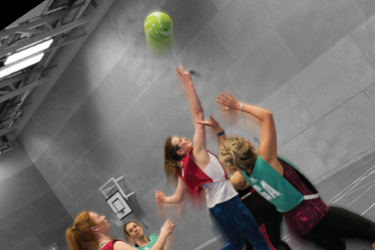 The first event, held at the shopping centre last year, was a great success; so now the club has returned for a ten-week run, starting today, at Walworth Methodist Church Hall (Clubland). Tickets are £5. 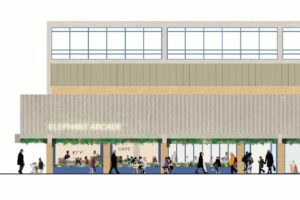 Last night (30 January) Southwark Council’s planning committee voted to defer Delancey’s application to redevelop the Elephant and Castle shopping centre as a new town centre for the area. Delancey issued a statement to say: “We welcome Southwark Council’s decision to defer the decision of our planning application. Our proposals offer a once in a lifetime opportunity to deliver essential regeneration to a key London location, which will bring almost 1,000 new homes to a site where none currently exist, desperately needed new transport infrastructure with a new Northern Line entrance and ticket hall, and ensure London College of Communication, UAL’s long term future in Elephant and Castle. Famous for ground-breaking films such as Dr Strangelove and Full Metal Jacket, Stanley Kubrick provides the inspiration for the latest London College of Communication (LCC) exhibition. 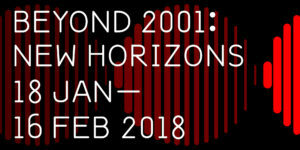 Beyond 2001: New Horizons is a bold, colourful and interactive exhibition that celebrates the tenth anniversary of the College’s acquisition of the Stanley Kubrick Archive. Rare and unique materials from the acclaimed director’s film productions, including 2001: A Space Odyssey, are on show alongside work created by LCC’s Screen School students in response. The exhibition runs alongside a series of talks, workshops and seminars until 16 February. Applications are invited for community projects requiring £500-£2,000 grant funding. 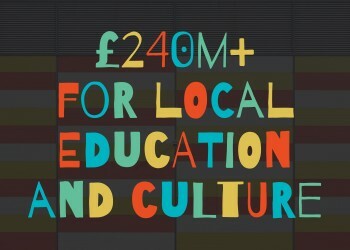 The Building Communities Fund is delivered via the Team London Bridge BID levy. 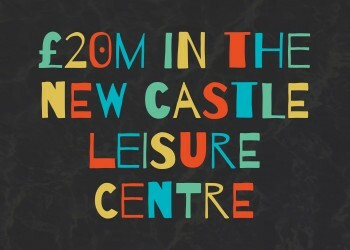 The grant consists of an annual pot dedicated to supporting local events, youth projects, residents’ activities and general community programmes. There are no set criteria in terms of beneficiaries’ age groups, though the majority of participants must live in SE1, SE16 or SE17. Funded projects must also work in accordance with Team London Bridge’s aim of supporting and promoting sustainable community places. The deadline for submitting your application is midday on Monday 12 February. Last night, Southwark Council’s planning committee voted against a recommendation from officers to approve Delancey’s planning application for the Elephant and Castle Town Centre development. The detailed reasons behind the decision weren’t formalised and the committee is scheduled to meet again on 30 January when it will formalise the grounds for the decision and vote again. Unused garages beneath Perronet House could become a new shopping arcade if council plans go ahead. The space beneath the council housing block is split into two garage areas, one of which is let to local residents. Southwark Council is proposing to convert 12 unused parking spaces in the other area (the closed, southern garage) into 11 retail units plus a community café with an entrance diagonally opposite the Bakerloo line station. The proposal would provide convenience shops for people living and working in the area and affordable retail space for local independent traders. 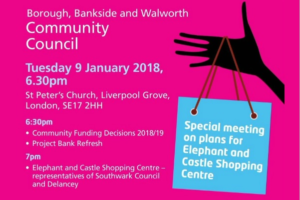 The next meeting of Borough, Bankside and Walworth Community Council will be a special meeting on the plans for Elephant and Castle Shopping Centre. It will be held at St Peter’s Church, Liverpool Grove SE17 2HH. Representatives from Southwark Council and Delancey will be present and there will be an opportunity to discuss the plans and ask questions. The meeting takes place on Tuesday 9 January at 6.30pm.